This study aims to determine the effect of temperature on the biological activity of various crude and precipitate specific Immunoglobulin (Ig)Y Canine parvovirus (CPV). Hiperimun serum conducted on Isa Brown chickens injected with antigen CPV. Crude yolk Ig preparations derived from chicken serum without purification while the yolk Ig preparations precipitates obtained by the chicken serum was precipitated with ammonium sulfate and dialyzed. Both types of Ig yolk given treatment temperature 50ºC, 60ºC, 70ºC, and 80ºC for 15 minutes. To test Gel Precipitation Test (AGPT) is performed to determine whether there is a specific IgY CPV in the serum of chickens. Biological activity of both types of Ig detected with Barriers Haemagglutination test (HI). The design used in this study is completely randomized design factorial. The results of this study indicate that the temperature was highly significant on the activities of IgY crude and precipitates. Activities IgY crude and precipitate down to the treatment temperature of 50ºC, 60ºC, 70ºC, and 80ºC. Geometric Mean Titer crude IgY respectively - were 26.67, 26, 25.33, and <2º Unit HI while IgY precipitates are respectively 26.33, 25.67, 24, and <2º Unit HI. Based on the results of this study concluded that the biological activity of crude IgY better than IgY precipitates after treatment of a wide range of temperatures. Burgess GW. 1995. Teknik serologi dalam mendiagnosis penyakit infeksius. Penerjemah WT Artama. Gadjah Mada University Press. Yogyakarta. Carlender D. 2002. Avian IgY antibody in vitro and in vivo. Acta Universitas Upsaliensis. Comprehensive Summaries of Uppsala Dissertations from the Faculty of Medicine, Uppsala. Ettinger SJ, Feldman EC. 1995. Text book of Veterinary Internal Medecine Vol. 2. Academic Press. USA. Hatta H, Tsuda K, Kim M, Yamamoto T. 1993. Productivity and some properties of egg yolk antibody (IgY) against human rotavirus. Biosci Biotechnol Biochem, 57: 450-454. Hau J, Hendriksen M. 2005. Refinement of polyclonal antibody production by combining oral immunization of chickens with harvest of antibodies from the egg yolk. ILAR J, 46: 294-299. Kapil S, Cooper E, Lamm C, Murray B, Rezabek G, Johnston L, Cambell G, Johnson B. 2007. Canine Parvovirus Types 2c and 2b Circulating in North American Dogs in 2006 and 2007. J Clin Microbiol, 45(12): 4044-4047. Muhammad KF, Rabbi I, Seed K, Hussain T. 2001. Passive immunization againt infectious disease in chicks. Int J Agric Biol, 3(2):12-18. Narat M. 2003. Production of Antibodies in Chickens. 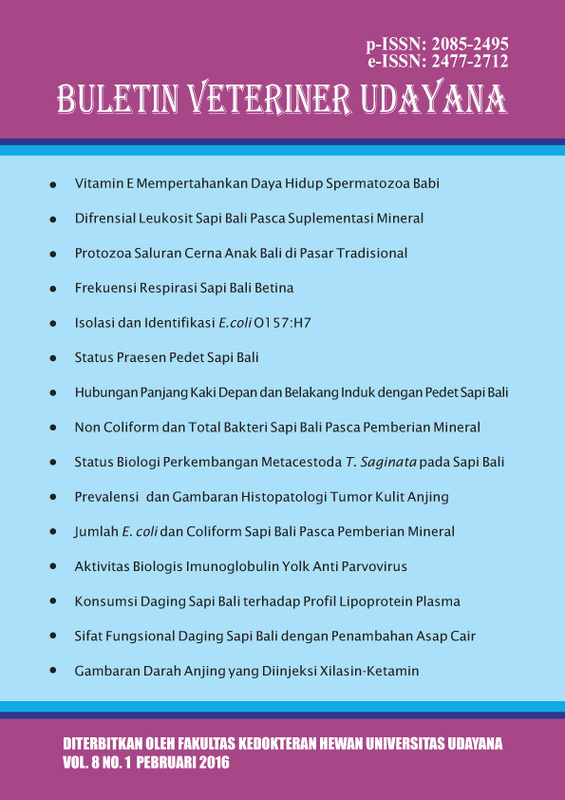 Food Technol Botechnol, 41:259-267. Nolan JK, Mine Y. 2004. Avian egg Antibodies: basic and potential application. Avian and Poultry Biology Reviews, 15(1): 25-46. Ophart CE. 2003. Virtual chembook. elmhurst college. London. Polson A, von Wechmar MB, Rogenmortel J. 1990. Antigenion of viral igy antibodies from yolk of immunized hens. Immunoglical Communication. 9:75-83. Sampurna IP, Nindhia TS. 2007. Metodologi ilmiah dan rancangan percobaan. Udayana University Press. Denpasar. Schade R. 2008. Chicken egg yolk antibodies production and application: IgY-technology. Suartini IGAA, Wibawan IWT, Suhartono MT, Suartha IN. 2007. Aktivitas IgY dan IgG antitetanus setelah perlakuan pada berbagai pH, suhu dan enzim proteolitik. J Veteriner, 8(4): 160-166. Sendow I, Syafriati. 2004. Seroepidemiologi infeksi canine parvovirus pada anjing. J ITV, 9(3): 54-58. Swango LJ. 1995. Canine viral diseases: textbook of veterinary internal medicine. W.B. Saunders, Philadelphia. Winarno FG. 1998. Kimia pangan dan gizi. Gramedia. Jakarta. Wise DJ, Carter GR, Flores EF. 2005. Laboratory diagnsis of viral infections. in: a concise review of veterynary virology. IVIS. A 3407.0305. Woolley JA, London J, Failen T. 1995. Comparison of antibody production to human interleukin-6 (Il-6) by sheep and chicken. Immunol Methods, 2: 253-256. Yilmaz Z. 2005. Distribution of antigen types of canine parvovirus type 2 in dogs with hemorrhagic enteritis in Turkey. Turk J Vet Anim Sci, 29: 73-76. Ziad W, Ronald J and Marquardt R. 2000. Studies on the stability of chiken igy in different sugars, complex carbohydrates. J Food and Agric Immunology. 12(4): 263-272. SUARTINI, I Gusti Ayu Agung et al. BIOLOGY ACTIVITIES OF IgY PARVOVIRUS AFTER HEAT TREATMENT. 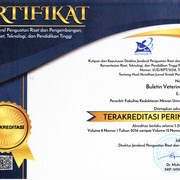 Buletin Veteriner Udayana, [S.l. ], feb. 2016. ISSN 2477-2712. Available at: <https://ojs.unud.ac.id/index.php/buletinvet/article/view/19676>. Date accessed: 22 apr. 2019.